Heading to Chapel Hill, NC to visit my sister. She hurt her arm and needs some “help” while her husband is away. I do expect to be a little helpful, but mostly it’s just what I need to expedite a long postponed visit. I got All My Work Done at McDonalds (thank you Richard for the perfect catch phrase for a successful day of employment), and had a few minutes at the end of my flight day to run around and fuss over plants. 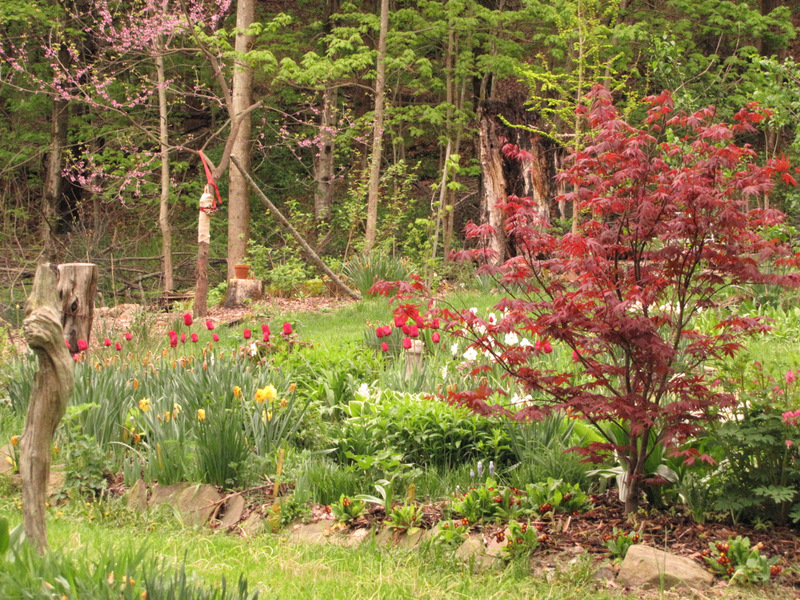 The irises are just starting, but this is a short trip and I expect I’ll catch them in full glory when I get back. Even rush hour and the Ithaca Festival didn’t make me late to the Ithaca Tompkins Regional Airport, a small, friendly place where I was informed that I didn’t really have to take off my shoes. And, as I am pre-checked, I can go in a special line at bigger airports and not even unpack my computer. There will be a large arrow pointing down at this line, young lady, I am told. 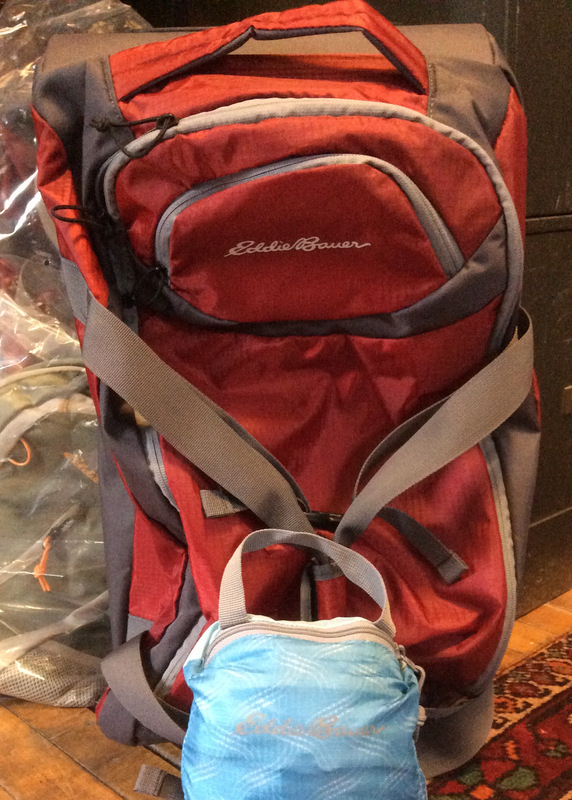 Then my new Eddie Bauer bag, which I love, disguised itself as a duffel and was allowed in the overhead. Score! I rarely travel on my own, so I was a little apprehensive about negotiating the trip. I’m usually just following someone else who’s sure to be moving so fast it takes all my visual concentration just to keep him in sight. Fortunately airports don’t have time to let nitwits wander randomly about, even half blind ones, and a Detroit attendant pointed me to the perfectly obvious sign that led to my gate. With an hour to kill, I had stew at the bar in Thee Irish Pub, where the bartender called everyone “My friend”, even when he had to chase down the woman next to me who skipped out on her tab. Good thing he caught her, or the rest of us would have gotten ideas. I mean really, it’s a perfect set up…. She was replaced by a young Mexican fella who gave me the recipe for refried beans (make beans, mash them in a frying pan with a little oil). This recipe is only topped by a Scottish friend of his who puts baked beans on toast and melts cheese over it. I am inclined to trust his taste, though, as when he suggested I put lime in my Irish stew, it was much improved. After an uneventful flight, I arrived in Raleigh-Durham, where a taxi driver and I conspired to use his GPS to get to Chapel Hill, where I had a good nights sleep, waking at dawn just to doze off again. 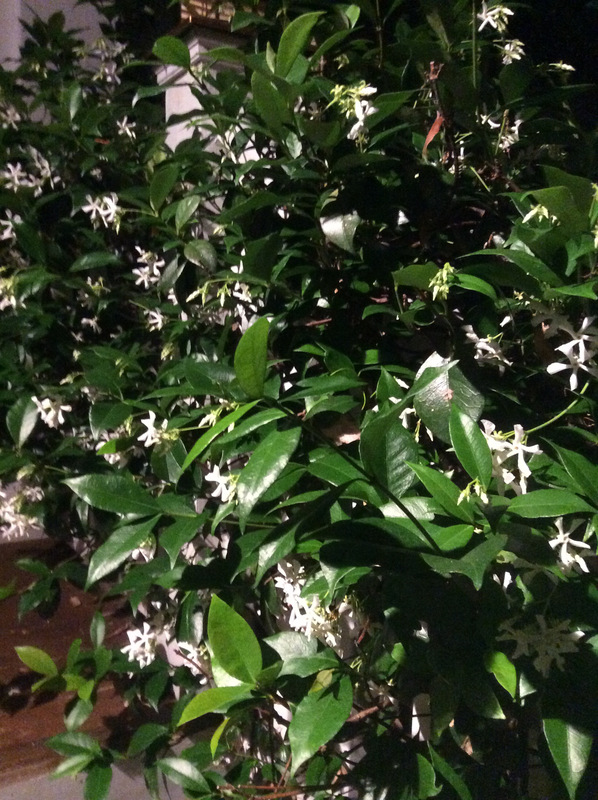 Today I spent hours drinking coffee on a screened in porch, the scent of jasmine wafting through. That is the iconic smell of the south to me, one I didn’t really live in, with porch swings and long, lazy afternoons. Must have read about it in a book. After talking and doing exercises (slight movements of the fingers and shrugging of the shoulders-is this heaven or what? 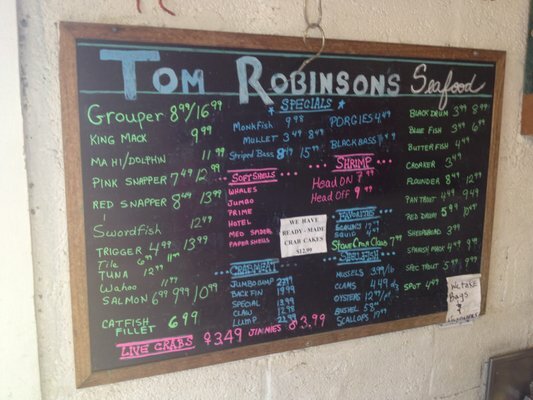 ), we eventually ran an errand to Tom Robinson’s Seafood. It was a shack, tiny, with fresh fish picked up from the coast twice a week. Not yet daunted, on our return home we took a walk around the spectacular yard her husband has meticulously landscaped. Along with magnificent trees, robust shrubs and hidden places to relax or entertain, it includes a few follies, perhaps unintentional, like a stone lined ditch worthy of the Roman Empire. Sisterly stories of past comi-tragedies-oh-my! For the first time in years we have all the time in the world to tell each other our stories. Were we really such rascals? Knowing the nature of memory, probably worse. Hours later, after plenty of coffee and a rigorous round of shoulder shrugging, we decided on another expedition. Since her injury made i t difficult for her to cut her toenails, my sister and I decided it was medically necessary for us to get pedicures. I have only had a manicure or pedicure once before, my life as a landscaper not lending itself to such niceties of femininity. With this in mind, I went for the gold, or rather, the blue. Although we sat around the waiting room forever, I still managed to ding my perfect paint job with the silly flip flops I tried to walk across the parking lot in. Oh, well. Beauty is Struggle. That evening we dined outside with her prodigal husband at the elements Restaurant, a place which advertises itself as both Posh and High End. I have no recollection of what I ate, but I can testify that the Jalapeno Cucumber martini(s) I had completely obliterated any lingering disappointment I may have felt over my partially botched foot decorating. Tomorrow it was back to New York and life in the Fast Lane, but tucked into my heart I would have a lovely, leisurely piece of the South to keep me warm. 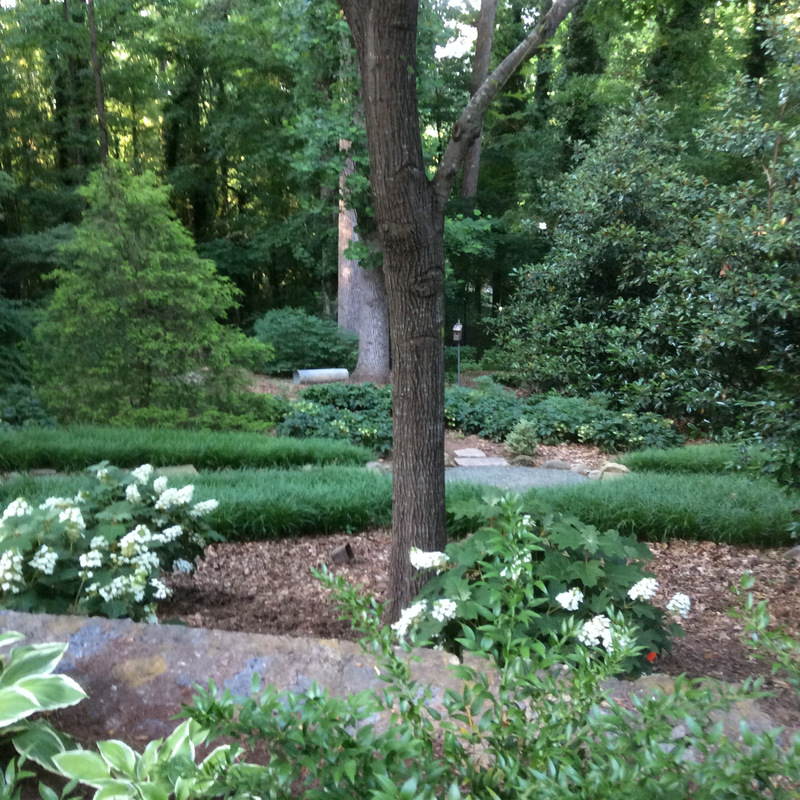 This entry was posted in Gardening, HOME & FAMILY, PLACE and tagged Chapel Hill by jiff3505. Bookmark the permalink. Time warp. Love the nails. Come home soon.